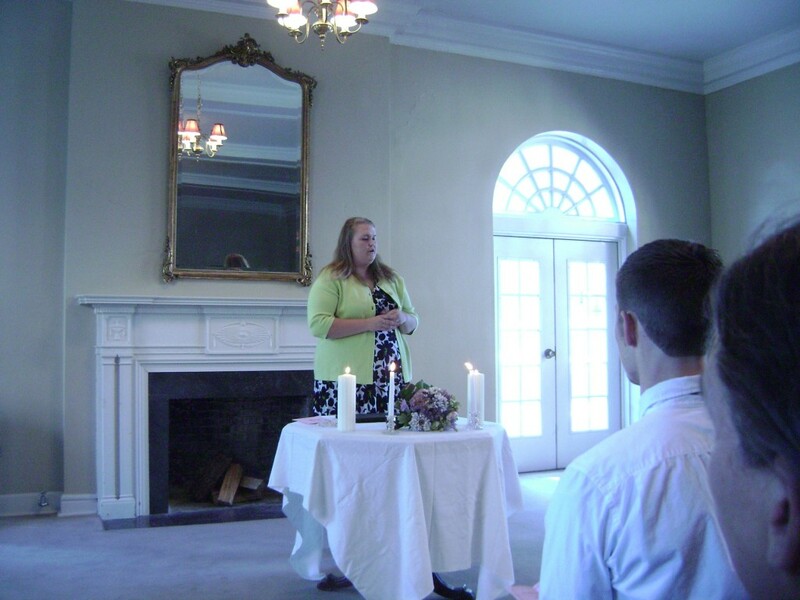 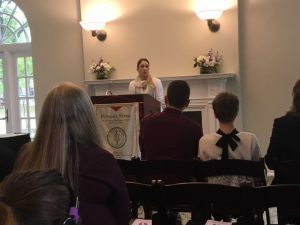 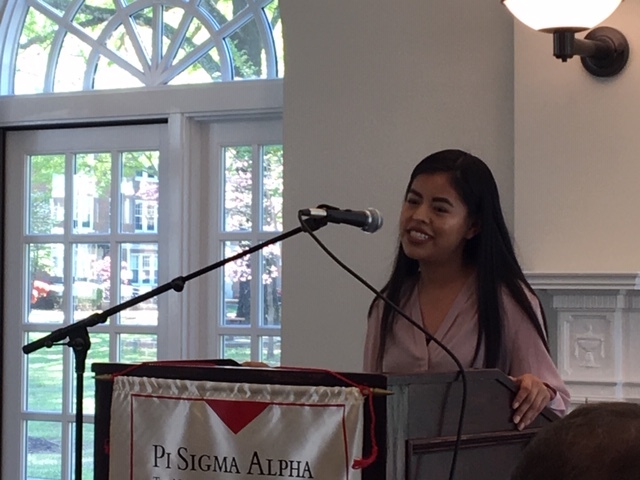 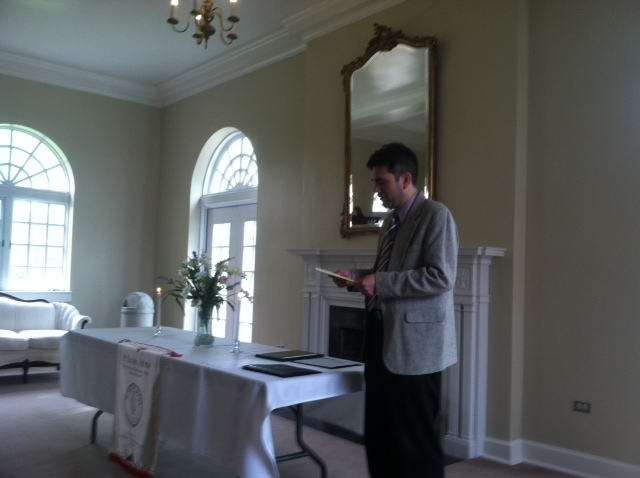 The 2019 Induction Ceremony for the UCA Chapter of Pi Sigma Alpha, the national Political Science Honors Society, was held in the Fireplace Room in McCastlain Hall on Monday, April 15, 2019. Dr. Heather Yates, Assistant Professor in the UCA Department of Political Science, served as Faculty Adviser for the UCA Chapter of Pi Sigma Alpha, and Itzel Velazquez served as President of the UCA Chapter of Pi Sigma Alpha in 2018-2019. 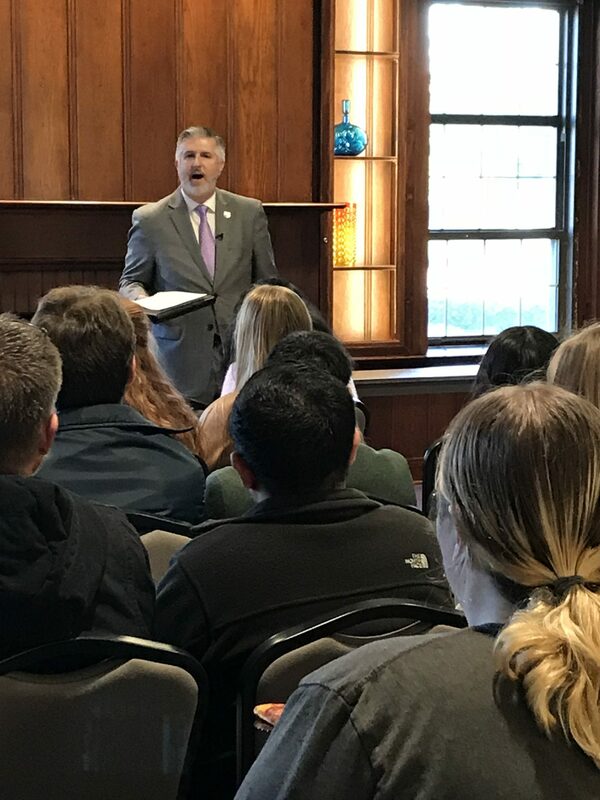 Dr. Peter Mehl, Associate Dean of the College of Liberal Arts at UCA, welcomed the students and guests to the induction ceremony. 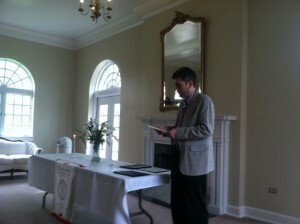 Dr. Clay Arnold, Chairperson of the UCA Department of Political Science, presided over the induction ceremony. Five political science students were formally inducted during the ceremony, including Jamie Matilda-Ann Benson, Jacob N. Holland, Logan C. Koprovic, Lauren C. McCauley, and Keely Rose Spugnardi. The Chairman of the UCA Department of Political Science, Dr. Clay Arnold, also presented the James D. Gingrich with the UCA Department of Political Science’s 2019 Distinguished Alumnus Award. Mr. Gingrich, class of 1977, is the Founder and Director of the State Courts Partnership at the Bowen School of Law in Little Rock. 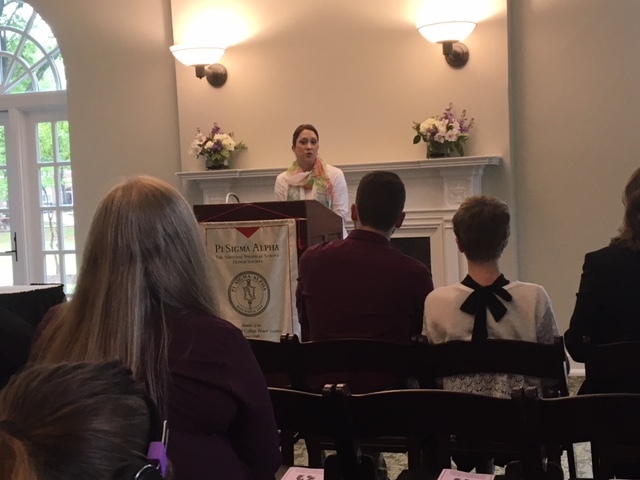 The 2017 Induction Ceremony for the UCA Chapter of Pi Sigma Alpha, the national Political Science Honors Society, was held in the Fireplace Room in McCastlain Hall on Wednesday, April 26, 2017. 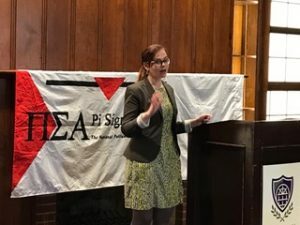 Dr. Joseph Howard, Associate Professor in the UCA Department of Political Science, served as Faculty Adviser for the UCA Chapter of Pi Sigma Alpha, and Danielle Casey served as President of the UCA Chapter of Pi Sigma Alpha in 2016-2017. 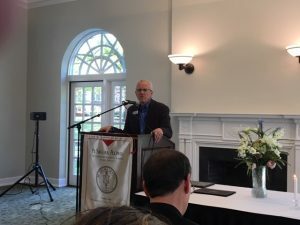 Dr. Maurice A. Lee, Dean of the College of Liberal Arts at UCA, welcomed the students and guests to the induction ceremony. 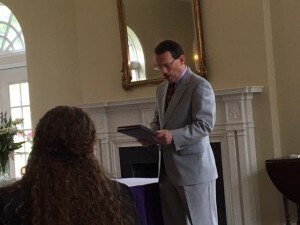 Dr. Clay Arnold, Chairperson of the UCA Department of Political Science, presided over the induction ceremony. 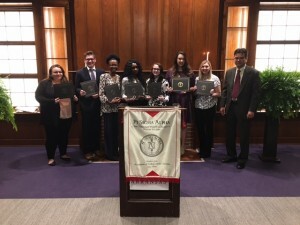 Eight students UCA students were formally inducted during the ceremony, including Abby Anderson, Alexander Battaglia, Denaej Brooks, France Galloh, Jordan Johnson, Ellen McKinnie, Michelle Moore, and Katelyn Wood. The Chairman of the UCA Department of Political Science, Dr. Clay Arnold, also presented the Honorable Brian Miller with the UCA Department of Political Science’s 2017 Distinguished Alumnus Award. Judge Brian Miller, who graduated with a bachelors degree in political science from UCA in 1992, has served as Chief U.S. District Court Judge of the Eastern District of Arkansas since 2012. 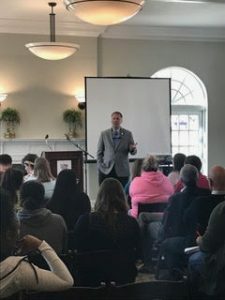 He was nominated to serve as a Judge on the U.S. District Court in the Eastern District of Arkansas by President George W. Bush in 2007, and the U.S. Senate confirmed the nomination in 2008. 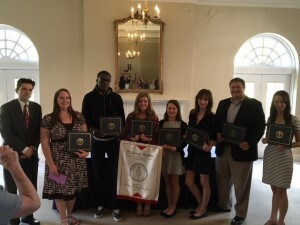 The 2016 Induction Ceremony for the UCA Chapter of Pi Sigma Alpha, the national Political Science Honors Society, was held in the Mirror Room in McAlister Hall on Wednesday, April 13, 2016. 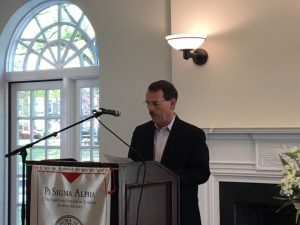 Dr. Joseph Howard, Associate Professor in the UCA Department of Political Science, served as Faculty Adviser for the UCA Chapter of Pi Sigma Alpha, and Katelyn Wilkins served as President of the UCA Chapter of Pi Sigma Alpha in 2015-2016. 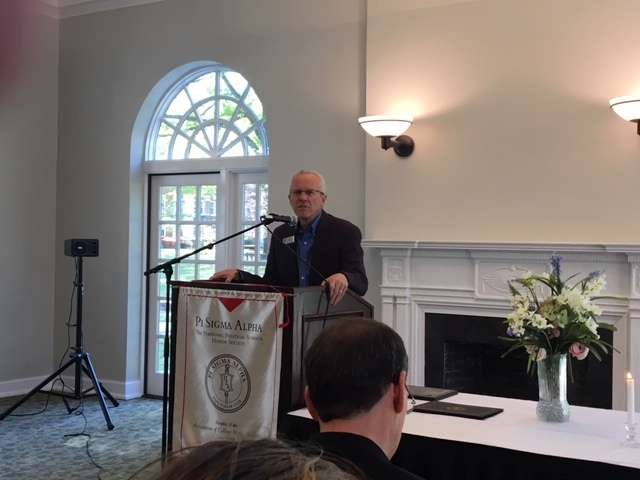 Dr. Maurice A. Lee, Dean of the College of Liberal Arts at UCA, welcomed the students and guests to the induction ceremony. 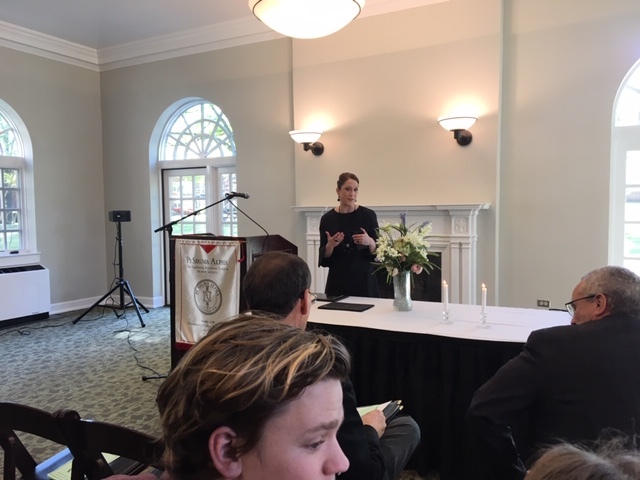 Nine UCA students were formally inducted during the ceremony, including Jean Francois Adoupo, Danielle Casey, Jillian Casper, Laura Craig, Eric Durham, Meredith Herring, Casey Jean-Elliott Johnson, Maleka Momand, and Bryce Moore. 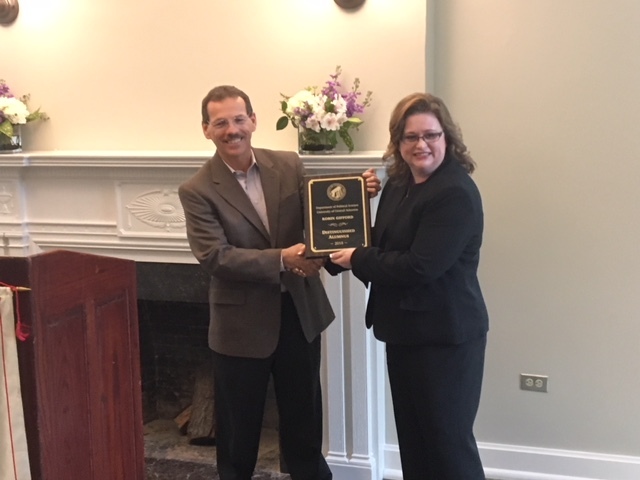 The Chairman of the UCA Department of Political Science, Dr. Clay Arnold, also presented Janet Harris with the UCA Department of Political Science’s 2016 Distinguished Alumnus Award. 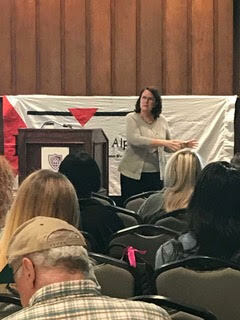 Janet Harris, who graduated with a bachelors degree in public administration from UCA in 1995, served as Deputy Auditor of the State of Arkansas (2011-2015) and Deputy Secretary of State of the State of Arkansas (2003-2011). 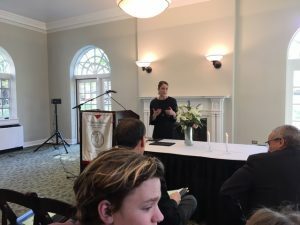 She currently serves as Director of Programs at The Winthrop Rockefeller Institute (2016-present). 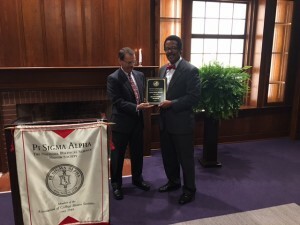 The 2015 Induction Ceremony for the UCA Chapter of Pi Sigma Alpha, the national Political Science Honors Society, was held in the Mirror Room in McAlister Hall on Wednesday, April 15, 2015. 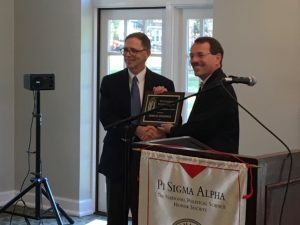 Dr. Joseph Howard, Associate Professor in the UCA Department of Political Science, served as Faculty Adviser for the UCA Chapter of Pi Sigma Alpha, and Melissa Cornwell served as President of the UCA Chapter of Pi Sigma Alpha in 2014-2015. Twelve UCA students were formally inducted during the ceremony, including Austin Ardwin, Kayla Close, Stephanie Daigle, Richard Frizzel, Matthew Goss, Laura Holzhauer, Hayden Knox, Brady Shiers, Kenneth Stice, Jesus Torres, Mallory Walker, and Katelyn Wilkins. 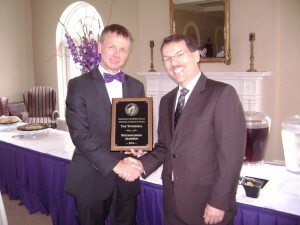 The Chairman of the UCA Department of Political Science, Dr. Clay Arnold, also presented Preston Scroggin with the UCA Department of Political Science’s 2015 Distinguished Alumnus Award. 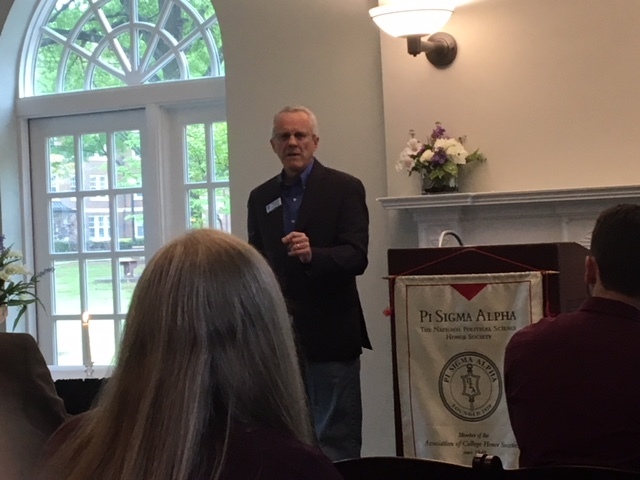 Preston Scroggin, who graduated with a bachelors degree in political science from UCA in 1989, served as Director of the Arkansas Livestock and Poultry Commission (2013-2015) and Faulkner County Judge (2007-2013). 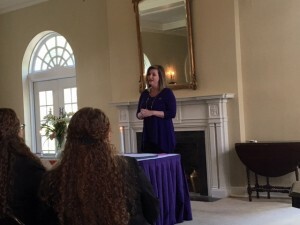 The 2014 induction ceremony for the UCA Chapter of Pi Sigma Alpha, the national Political Science Honors Society, was held in the Mirror Room in McAlister Hall on April 17, 2014. 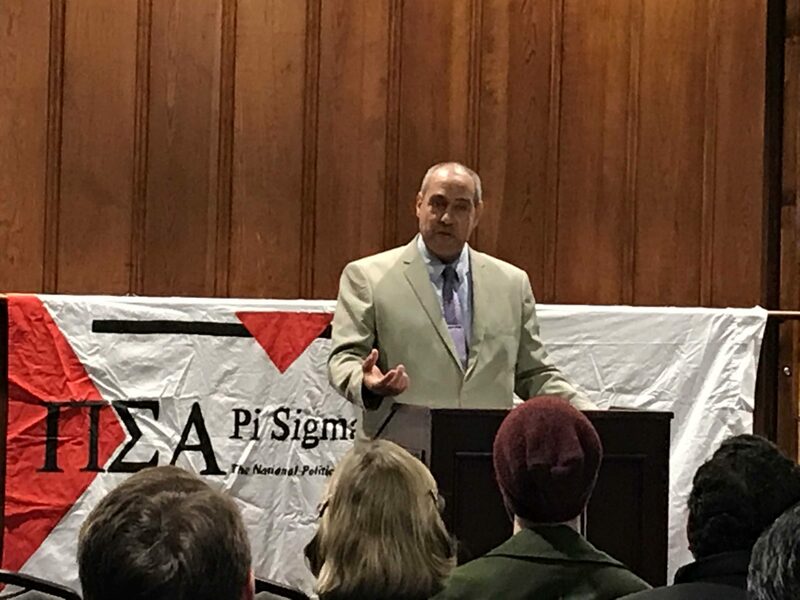 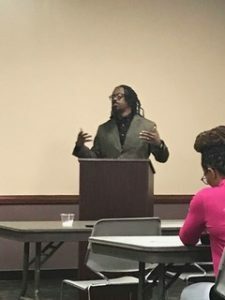 Dr. Joseph Howard, Associate Professor of Political Science, served as Faculty Adviser for the UCA Chapter of Pi Sigma Alpha. 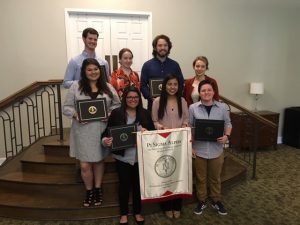 Eleven UCA students were formally inducted during the ceremony, including Bryan Altman, Bethany Bell, Tess Bradford, Seth Bradley, Jill Carlson, Melissa Cornwell, Katie Farely, Felipe Fernandez, Julius Gerard, Stephanie Gray, and Juan Mayen. 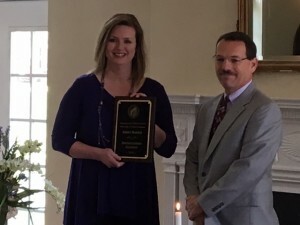 During the ceremony, Tab Townsell, Mayor of the City of Conway, was presented the UCA Department of Political Science’s Distinguished Alumnus award. 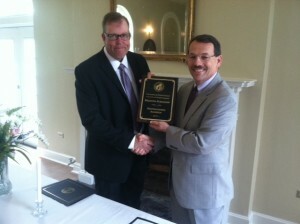 Tab Townsell graduated with a bachelors degree in political science from UCA in 1983. Blake Brizzolara (Political Science) and Bethany Bell (International Studies) were honored as the Department of Political Science “Outstanding Student” award winners for 2013-2014. The 2013 induction ceremony for the UCA Chapter of Pi Sigma Alpha, the national Political Science Honors Society, was held in the Mirror Room in McAlister Hall on April 18, 2013. 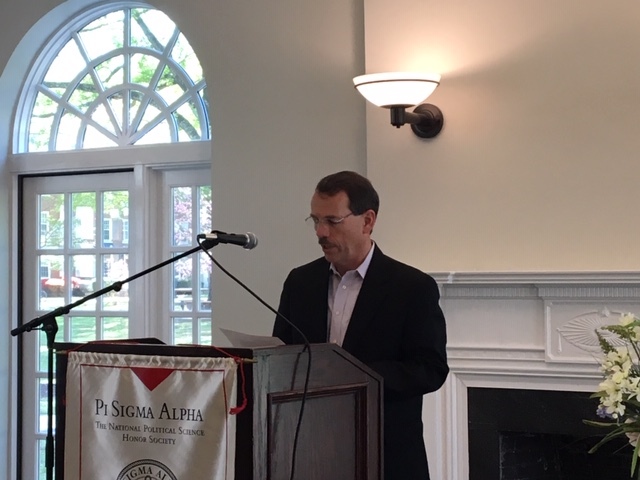 Dr. Joseph Howard, Associate Professor of Political Science, served as Faculty Adviser for the UCA Chapter of Pi Sigma Alpha. 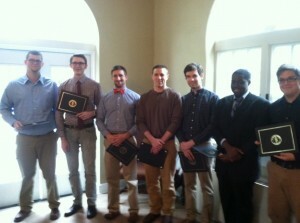 Eight UCA students were formally inducted during the ceremony, including Blake Brizzolara (Political Science), Andrew Harris (International Studies), Benjamin Lykins (Public Administration), Derrick Moses (International Studies), Cory Nelson (Public Administration), Timothy Scott (International Studies), Forrest Stobaugh (Political Science), and Shastady Williams (Political Science). 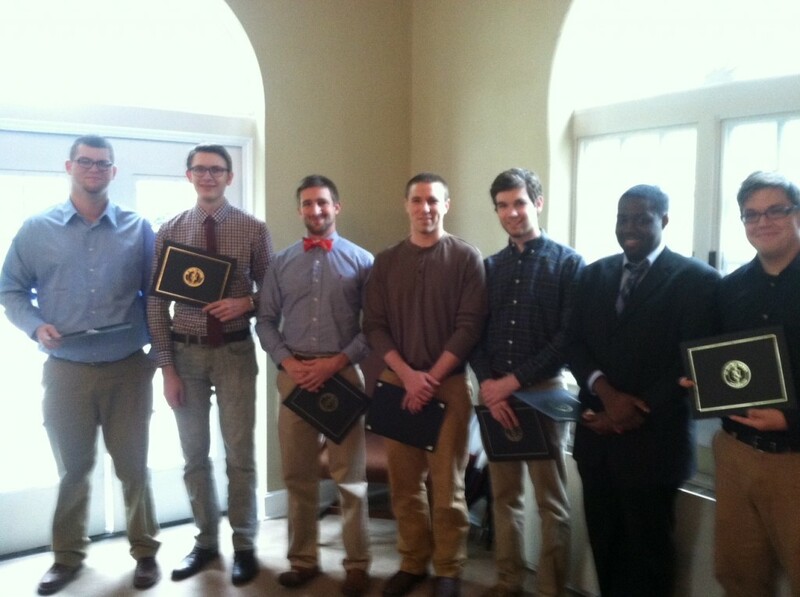 Pi Sigma Alpha inductees (l to r): Forrest Stobaugh, Cory Nelson, Benjamin Lykins, Andrew Harris, Blake Brizzolara, Derrick Moses, and Timothy Scott. 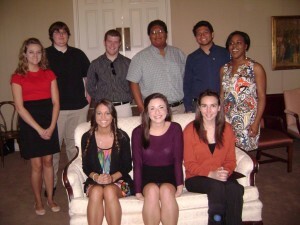 Not Pictured: Shastady Williams. 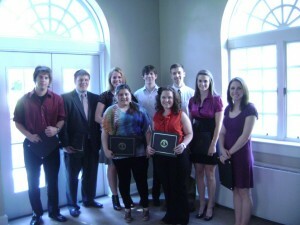 The 2012 induction ceremony for the UCA Chapter of Pi Sigma Alpha, the national Political Science Honors Society, was held in the Mirror Room in McAlister Hall on April 18, 2012. 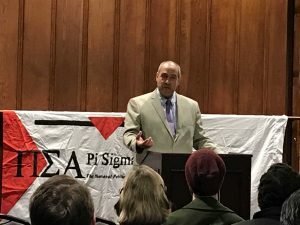 Dr. Joseph Howard, Associate Professor of Political Science, served as Faculty Adviser for the UCA Chapter of Pi Sigma Alpha. The chapter’s officers in 2011-2012 were Ben Maddox (President), Naruhiko Tsukuda (Vice-President), Sara Bayles (Secretary), and Hitomi Kawakami (Treasurer). 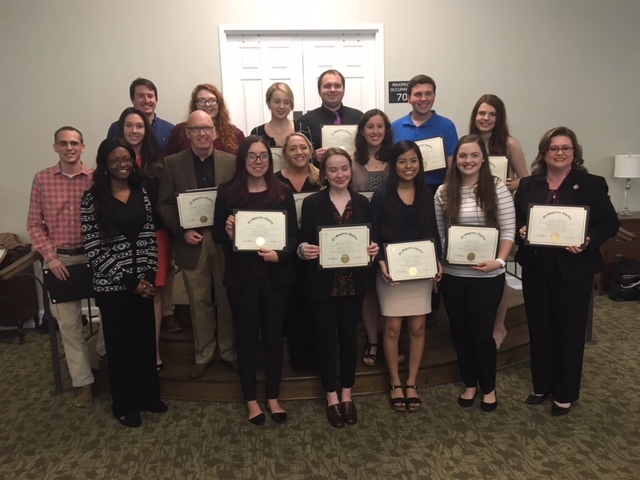 Nine UCA students – Raymond Terry, Jack Phillips, Emily O’Neal, Willis Arnold, Brett Roberts, Brittani Burnette, Brandi Starnes, Wendy Marin and Shannon Kelly – were formally inducted into Pi Sigma Alpha during the ceremony.